Sharpless epoxidation converts a prochiral allylic alcohol into the corresponding chiral epoxide with > 90% enantiomeric excess,. Here is the first step in trying to explain how this magic is achieved. The scheme above shows how (achiral) prop-2-enol is converted using the asymmetric catalyst (R,R)-diethyl tartrate and t-butyl hydroperoxide as oxidant into the (S)-chiral epoxide. The first step is to try to construct a simple model for the reaction, and in this post I will start by using one titanium as the core of the stage on which these actors will perform. This is the mononuclear model†. One can simply envisage that a molecule of tartrate displaces two iPrOH molecules from Ti(OiPr)4 in an ester exchange to form a Ti(OiPr)2(tartrate) complex. The remaining two iso-propanols are then replaced by one molecule each of prop-2-enol and tBu-OOH. 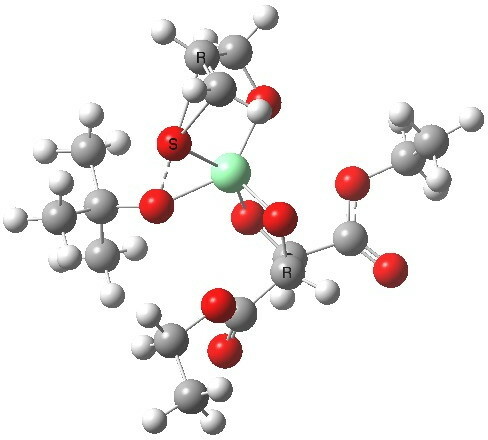 Now we have the species Ti(OOtBu)(O-CH2CH=CH2)(tartrate) as the starting point from which a transition state for oxygen transfer to the alkene to form the (S) epoxide (for R,R tartrate) can be constructed (ωB97XD/6-311G(d,p)/SCRF=dichloromethane model). Mononuclear TS for S-epoxide. Click for 3D. Mononuclear TS for R-epoxide. Click for 3D. 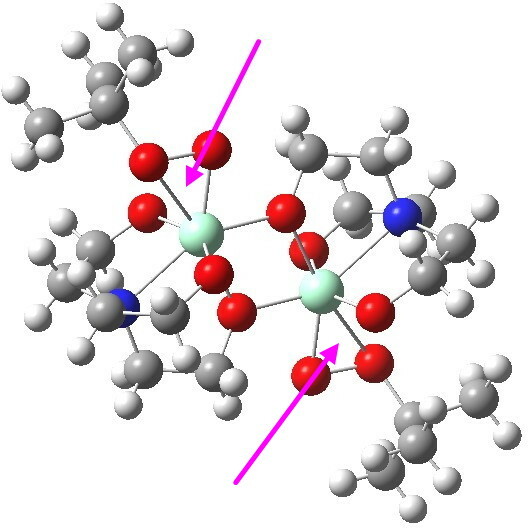 The transition state leading to (S) epoxide emerges as 0.86 kcal/mol higher in ΔG‡ than the (R), contrary to the experimental result where (S) is formed with high specificity. 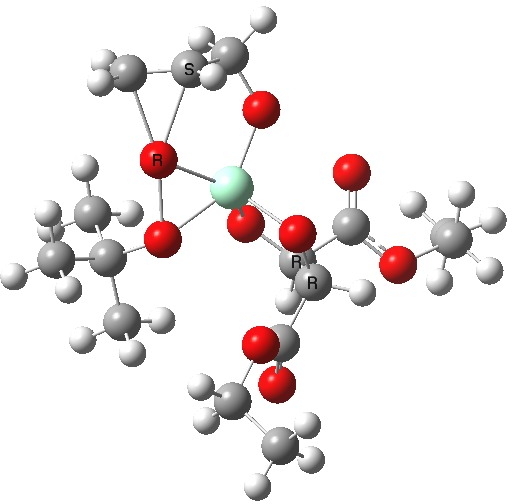 Inspecting the model, it is clear that the allylic alcohol substrate sits in a very open pocket un-encumbered by any nearby groups (bottom right in the animation above) and so the lack of π-facial selectivity is perhaps not surprising. 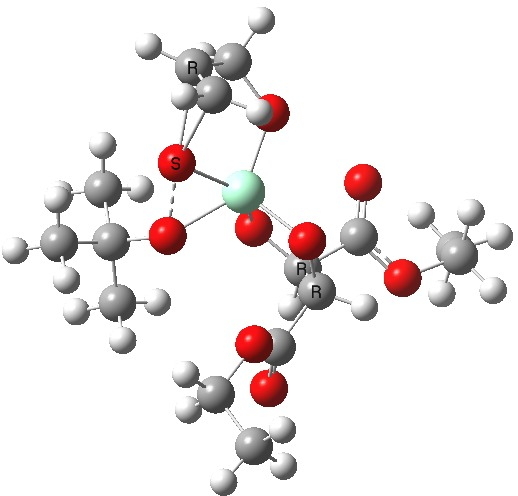 In the follow-up post, we will see whether these binuclear models can do better at explaining the enantioselectivity of the Sharpless reaction. 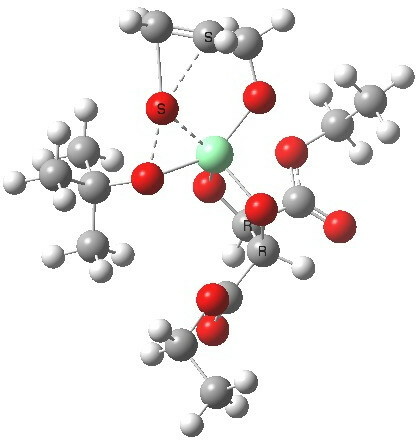 † See this post for an example of such “single-site” catalysis using Mg or this article for an example using silver. ¶A binuclear Zn catalyst with similar oxy-bridges is used to co-polymerise epoxides themselves with carbon dioxide. 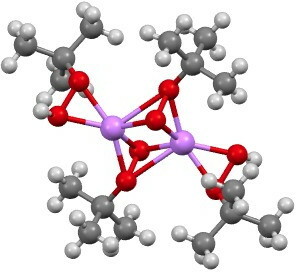 Many such binuclear complexes are known. ‡ The other element for which a number of examples of such t-butyl peroxy bonding are known is oddly enough, lithium. Postscript: Two lower energy conformations for the S and R transition states have been found, the latter being 1.6 kcal/mol lower in free energy. This entry was posted on Sunday, December 9th, 2012 at 8:56 am and is filed under Interesting chemistry. You can follow any responses to this entry through the RSS 2.0 feed. You can leave a response, or trackback from your own site. Why is the Sharpless epoxidation enantioselective? Part 1: a simple model. is licensed by Henry Rzepa under a Creative Commons Attribution-Noncommercial-Share Alike 3.0 United States License.